One of my favorite home energy devices is the GFX, a piece of plumbing that recovers energy from drain water and diverts it back to your water heater (or sometimes to the cold side of the shower). The waste water is not mingled with the potable water: only energy is transferred. The reason I like it so well is that it has no moving parts and is completely passive. This is appropriate technology at its best. It’s solid copper and will last as long as any copper pipe in your house (pretty much forever unless you have a lot of sand in your water). The GFX is made entirely of copper and must be installed exactly vertical. This installation shows preheated water feeding the cold side of the shower. Probably heat recovery is best when the preheated water feeds the water heater because of higher flow on the cold side of the DHR. The way it works: cold water coming into the house is diverted to a coil that wraps around the home’s main drain line. Warm water that drains out of the house passes through a pipe in the center of the coil, and cold water circulating around the drain line picks up heat from the drain water. Drain water leaves the house cooler than it otherwise would, and water arriving at the water heater is warmer than it otherwise would be. With warmer water coming in, the water heater doesn’t have to work as hard to bring the water up to temperature. This kind of device only works when hot water is being used at the same time that warm water is draining: mostly that’s showers. Sometimes the heat recovery device is located on the drain line under the primary shower instead of on the home’s main drain, and sometimes the preheated fresh water is sent to the shower instead of the water heater, allowing the showerer to mix in more “cold” water instead of using 100% water from the water heater. Limitations: the GFX can only be installed in a vertical orientation. Some homes don’t have enough vertical drain line to fit a GFX. Also, since the GFX is solid copper, it has become more expensive as worldwide copper prices have shot up. New on the market: a DHR that can be installed in a non-vertical orientation, and is partially constructed with fiberglass. 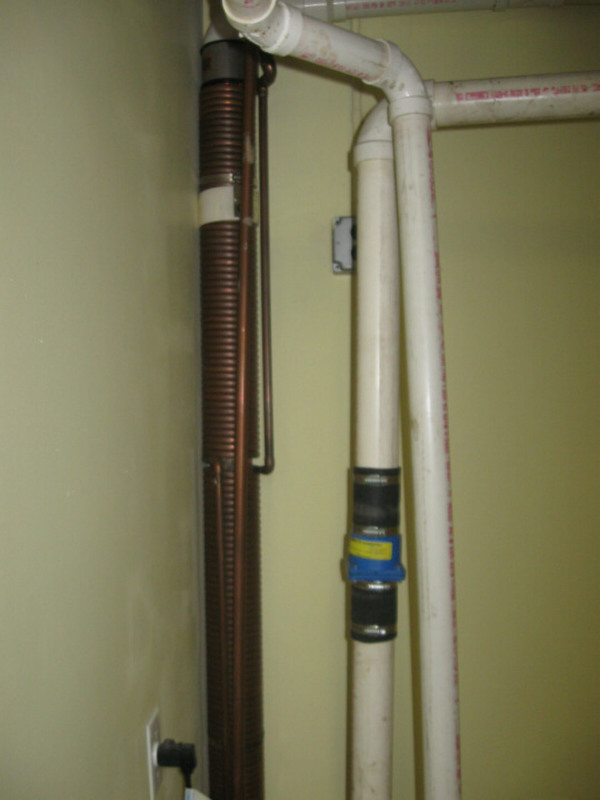 The Ecodrain works in the same way as the GFX, but has the copper heat exchanger only on one side of the pipe. Is it worth it? I’d guess that most families use 25-50% of the daily hot water on showers. DHR will recover a little bit of heat during non-shower events, but you can only count on heat recovery during showers. The DHR cuts by about half the amount of energy needed to heat up the replacement water headed to the tank. Using very rough numbers, you could expect about 18% savings on your water heating energy. 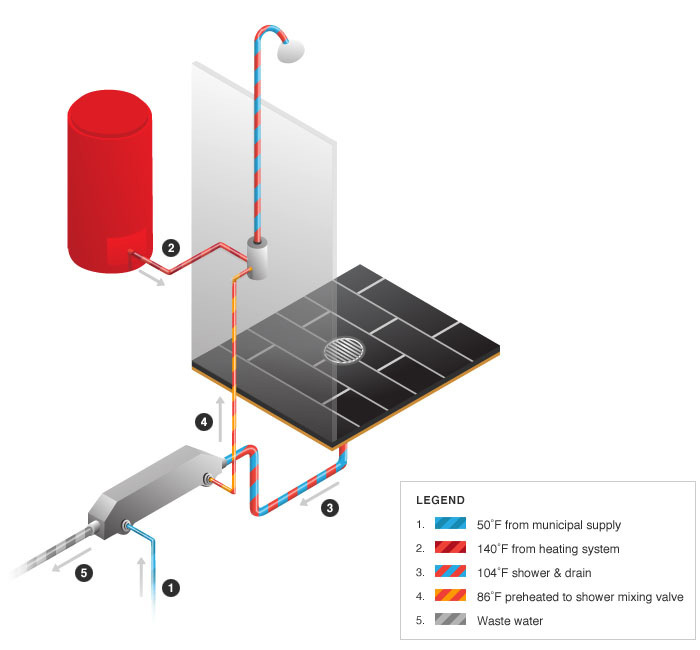 With a heat pump water heater, that’s about 270 kWh/year, or $675-worth of PV installed. At $530 for the GFX and $450 for the Ecodrain, yes, it’s worth it! And, you could probably downsize your heat pump water heater if you have a DHR. This entry was posted in Water Heating and tagged heat recovery, water heating. Bookmark the permalink.